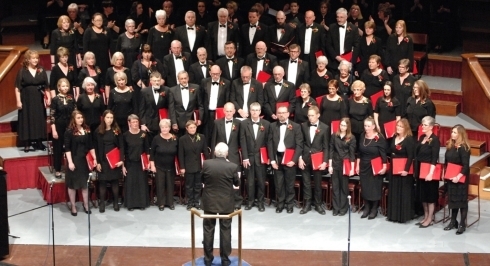 If you wish to make a comment about Voices In Harmony why not use our guestbook, accessible here or from our main menu. 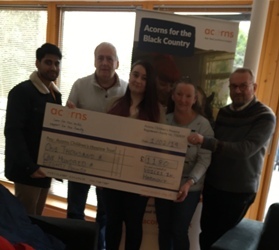 Representatives from Voices In Harmony present a cheque for £1180 to Acorns Hospice. 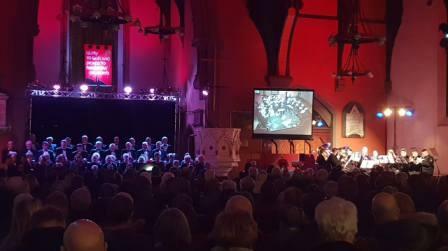 Voices In Harmony together with Travelling Brass, a superb group of brass players from various parts of the UK, and Pure Harmony, the Voices In Harmony young people's choir, staged their annual Christmas charity concert at Holy Trinity Church, Old Hill on Saturday 15 December 2018. The charity chosen for this year was Acorns Children's Hospice. 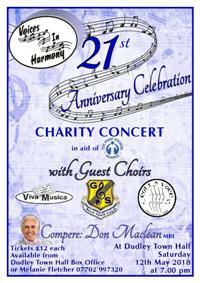 Over £1000 had been raised at the time of the concert. Voices In Harmony will be continuing to raise money for Acorns Children’s Hospice at Barnett Hill Garden Centre on the morning of Christmas Eve where they will be singing Christmas music. 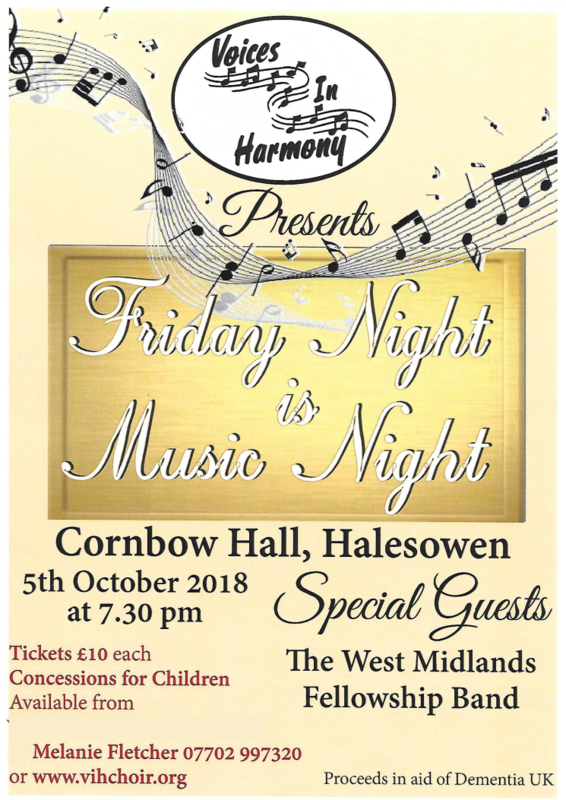 Voices In Harmony were joined by special guests The West Midlands Fellowship Band. The audience enjoyed a varied programme from both the band and Voices In Harmony, together with an informative and interesting short presentation about the work of Dementia UK and it's Admiral Nurse service from a volunteer representative speaking from first hand experience. The concert raised a total of £1285 for Dementia UK. A big thank you to all who supported us. 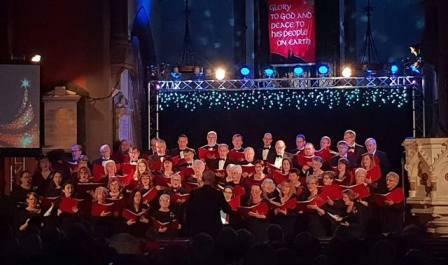 Three other local choirs, Gentlemen Songsters Male Voice Choir, Colla Voce Chamber Choir and Viva Musica joined with Voices In Harmony for this concert. Radio & TV legend Don Maclean MBE ably compered the proceedings with his distinctive brand of humour! The audience, which included civic dignitaries from both Sandwell and Dudley and also representatives from The Mary Stevens Hospice, enjoyed a range of music covering most genres from classical through the musicals to Queen! 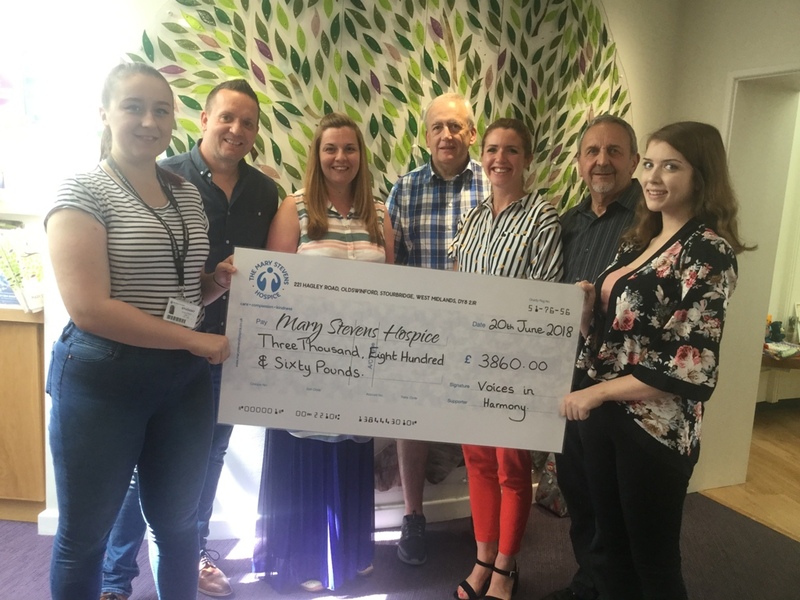 All of the money raised through the concert has now been donated to Mary Stevens Hospice, with representatives of the choir handing over a cheque for £3860 to fundraisers on 20 June 2018. “It was an evening that will live long in the memory of everyone in attendance, and a truly wonderful way to celebrate 21 years of such a fantastic organisation. For our patients to have been chosen as the beneficiaries of such a wonderful evening really is overwhelming and we're so grateful to everyone who worked so hard to bring the concert to life in support of our families. For more photographs select Photographs from our menu or click here. To view Guestbook comments select Guestbook from our menu or click here. We are currently seeking a competent and committed member for each section (Soprano, Alto Tenor and Bass). Interested in booking Voices In Harmony? If you are interested on booking Voices In Harmony for an event please contact our Secretary. Please note we are almost fully booked for 2019. Offers for 2020 bookings are now being invited for consideration alongside our existing commitments. Tickets: Available on the door. No entry charge. Collection for charity. 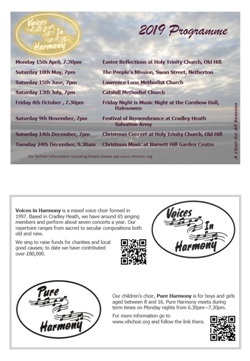 Click on image below to see our flier (pdf) showing our events in 2019 and information about Voices In Harmony and Pure Harmony.